FRESNO, Calif. – On an exhilarating evening that featured action fights highlighted by crowd-pleasing victories by Fresno fan favorites Lavar Johnson and Billy Evangelista, Bobby Voelker (23-8), of Kansas City, Mo., evened the score with previously undefeated Roger Bowling (8-1) of Cincinnati with a second-round TKO (punches) in the main event Friday on STRIKEFORCE Challengers live on SHOWTIME® from the Save Mart Center. 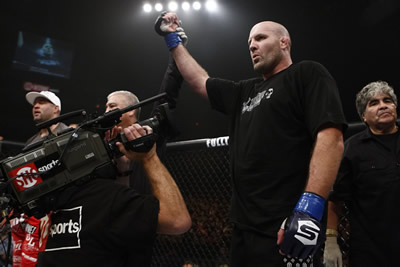 In other results on the televised portion of an event presented by STRIKEFORCE and Rockstar Energy Drink: Johnson (15-3), of Fresno, scored an explosive 2:17, first-round knockout over Virgil Zwicker (9-2), of Temecula, Calif., in a heavyweight scrap; the comebacking Evangelista (11-0, 1 NC), of Fresno, won the fight of the night with a thrilling, crowd-pleasing, hard-fought three-round unanimous decision over Waachiim Spirit Wolf (8-7-1), of San Diego, Calif., in a catch weight bout at 165 pounds; Julia “The Jewel” Budd (1-0), of Sechelt, British Columbia, made an instant impression at 145 pounds, impressively winning her pro debut with a second-round TKO (punches) over previously unbeaten Shana Olsen (4-1), of Burnsville, Minn., and John Devine (5-2), of San Francisco, submitted (rear-naked choke) Brandon Cash (5-3), of Fresno, at 3:20 of the first round in a heavyweight match. Voelker lost a technical decision to Bowling five months ago on STRIKEFORCE Challengers when an exciting encounter ended prematurely due to an accidental poke in the eye in the third round. Friday, however, the 6-foot, 31-year-old Voelker shook off a fast start from the aggressive-minded Bowling to triumph decisively in perhaps a career-best performance. It was Voelker’s ninth victory in 12 starts. Johnson was fighting for the second time since he was gunned down while attending a family barbeque during the July 4 holiday in 2009. The 6-foot-2, 33-year-old survived three gunshot wounds sustained during the walk-by shooting that led to the death of a cousin. A father of two young boys, Johnson spent 30 days in a hospital, fighting for his life, and several more months rehabilitating. Friday, the hard-hitting Johnson, who has never been victorious via decision, looked as good as new as he earned his seventh consecutive knockout victory. “This was just the kind of fight I wanted,’’ said Johnson after dropping the game Zwicker with a four-punch salvo that prompted the referee to step in and halt matters at 2:17. “I give Zwicker a lot of credit. He came to fight like I knew he would. But I wanted to make a statement. There are a lot of big-name heavyweights in STRIKEFORCE and I feel it’s time I get my shot at one of them. Evangelista, making his first start since Nov. 6, 2009, won an absolute slugfest by the scores of 30-27 twice and 29-28. The extremely popular local fighter is a natural 155-pounder and Friday’s fight was at a catch weight of 165. The naturally bigger and stronger Spirit Wolf, who fights at welterweight (170), used his size and strength to his advantage throughout and some thought the scoring could have been closer. Spirit Wolf, who took down Evangelista no less than three times, felt he deserved much better. “I come to fight and that’s what I did tonight,’’ he said. “It is bad enough I thought I deserved the decision, but to not get a round on those scorecards is ridiculous. Honestly, I feel I got ripped off. Despite losing a blow for delivering an illegal elbow late in the first round, Budd dominated the more experienced Olsen. Although it would be unrealistic, after just one fight, for her to even entertain thoughts of facing STRIKEFORCE World Champion Cris Cyborg, the No. 1 female fighter in the world, Budd’s performance against Olsen clearly showed that she deserves to be mentioned at or near the top of a short list of possible challengers at 145 pounds. 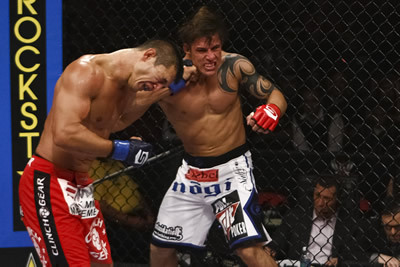 The victory by Devine came in his first start since losing to Daniel Cormier last March 26 on STRIKEFORCE Challengers. The telecast also will be available On Demand beginning this Monday, Oct. 25. Mauro Ranallo called the action on SHOWTIME with MMA legend Pat Miletich and The Fight Professor, Stephen Quadros, serving as expert analysts. In Friday’s non-televised professional result: David “Tarzan’’ Douglas (5-2) of Antioch, Calif., rallied impressively to register a second-round TKO (punches) over previously undefeated Dominic Clark (4-1) of Fresno. UPCOMING STRIKEFORCE EVENTS ON SHOWTIME: STRIKEFORCE Challengers will be in Jackson, Miss., on Friday, Nov. 19 (11 p.m. ET/PT). In the main event, lightweight star and Brazilian Jiu-Jitsu black belt Vitor “Shaolin” Ribeiro (20-4) will take on streaking Justin “The Silverback” Wilcox (9-3) of Cincinnati at the Jackson Convention Complex. MMA legend Dan Henderson will face former STRIKEFORCE World Champion “Babalu” Sobral when STRIKEFORCE returns to St. Louis on Saturday, Dec. 4, at Scottrade Center (10 p.m. ET/PT). In featured bouts, Paul “Semtex’’ Daley (25-9-2) of Nottingham, England, meets Scott “Hands Of Steel’ Smith (17-7, 1 NC) of Elk Grove, Calif., in a welterweight match, “Ruthless “Robbie” Lawler (17-6, 1 NC) of Elk Grove, Ill., takes on 2000 Olympic Games silver medalist Matt Lindland (22-7) of Oregon City, Ore., in a middleweight scrap, top contender and former EliteXC champion Antonio “Big Foot’’ Silva (14-2), of Coconut Creek, Fla., by way of Brazil, throws down with the older brother of STRIKEFORCE World Heavyweight Champion, Alistair Overeem, Valentijn “The Python’’ Overeem (28-23), of Amsterdam, The Netherlands, football legend and unbeaten MMA fighter Herschel Walker (1-0) will meet an opponent to be announced and St. Louis native Jesse Finney will face a foe to be determined. 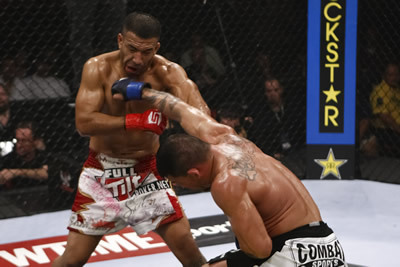 For more information on SHOWTIME Sports, including exclusive video, photos and news links on SHOWTIME CHAMPIONSHIP BOXING and STRIKEFORCE mixed martial arts telecasts, along with access to the SHOWTIME Sports Facebook® and Twitter® pages, please go to http://Sports.Sho.com.